We've been anxiously awaiting the next creation from Hampton Creek ever since the launch of Just Mayo, and we definitely weren't disappointed when we tried their amazing new vegan salad dressings! GMO-free, 100% vegan and made without dairy or eggs normally found in so many other dressings on the market, these tasty dressings give you plenty of new ways to spruce up your salads, dip your favorite veggies, or top off your sandwiches. 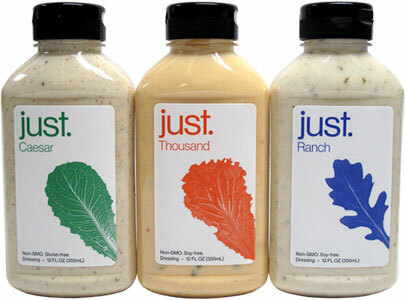 Choose from 5 delicious varieties including Ranch, Caesar, Italian, Thousand Island and Balsamic. 12 fl. oz. (355mL) squeeze bottles are $5.49 each. Gluten-free. From eggplant of Vineland, New Jersey on 6/22/2017 . From Stephanie of Scranton, Pennsylvania on 1/26/2017 . Not ashamed to admit I bought every flavor I could find when these first came out. I have a shelf dedicated to Hampton dressings & mayos. :) It's true! My favorite is Caesar. But, nothing has disappointed. The Ranch is super with "chicken" tenders. The Balsamic is tangy & thick. The Italian is that traditional "restaurant" style one remembers as a kid. BTW, I caught one of my cats licking from the bowl of Ranch when I wasn't watching. Oops! I've only tried the ranch and the new thousand island (not listed here) I found at Target so far, and I can tell you they are both very solid offerings. In my opinion, this ranch is much better than Daiya's and at least on par with Follow Your Heart's high-omega ranch. I have the feeling that if you switched this dressing with a regular one at a salad bar, people wouldn't much be able to tell. I must say I'd prefer to find a healthier ranch, and I am sure Liferegenerator's coconut-almond yogurt ranch will suffice.